Behavior Development Solutions would welcome the opportunity to assist your university in teaching students the skill set identified by the BACB. The CBA Learning Module Series (CBA LMS), first developed in 1998, provides an interactive experience by engaging students in learning exercises focusing on questions equipped with instructional content, text references, and real-time corrective feedback. 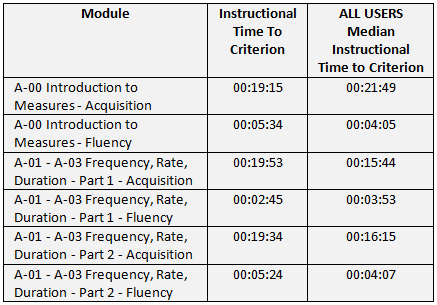 The active responding required in the CBA LMS v8 is so integral that the BACB allows its use to be considered "instructional time" as described in the VCS Handbook. Currently, the CBA LMS v8 features over 3,200 unique questions that teach the principles and concepts outlined in the BACB's 4th Edition Task List. With the recent release of the 5th Edition Task List, a new version is under development with a prospective release date of September, 2018. Our learning platform interface is constantly evolving to provide more useful data analysis and management tools. Many features have been enhanced with improvements stemming directly from feedback provided by program directors, instructors, and supervisors. Over 100 universities have partnered with us allowing students to obtain CBA LMS subscriptions at reduced rates, either as an adopted requirement or recommendation. Collaboration is essential to advancing the education of the next generation of behavior analysts, and it is with great confidence that we present our material for your review. Increase mastery with acquisition and fluency based learning exercises. Increase university pass rates. Gratis administrative and user licenses available with adoption. Compatible with PCs, Macs, tablets, & mobile devices. Accessible anywhere with an Internet connection. Dashboard provides at-a-glance student information. BDS assists with implementation strategies and data analyses. Personal Study Scheduler utility manages progress toward goals. Group students into cohorts for easy organization; assign due dates which populate on student dashboards. Generate individual progress reports and review incorrectly answered questions, hints and corrective feedback. Generate or download progress reports at the module and cohort level. the average of all learners worldwide. Compare student performance to the average of all learners worldwide. Pre-/Post-Tests allow assessment of strengths and weaknesses. Target strengths and weaknesses of the course sequence. Examine low scoring objectives. The Behavior Analyst Certification Board's published pass rates assist prospective students in selecting verified course sequences and help promote those that are most successful. However, the pass rate data are summarized and provided annually based on students' performance on the BCBA and BCaBA exams who took most or all of their courses years earlier (8 to 18 months minimally). Due to this delay, it is impossible to identify from which cohorts BACB pass rate data are representative, and therefore, difficult to identify weaknesses and alter course content for current students. The CBA Learning Module Series is the only BCBA/BCaBA curriculum supplement that enables a comparison of both individual student and cohort data to the average of all licensees, thereby assisting program directors in making formative, data-based decisions from thousands of recent licensees. How does an individual student compare to the average of all users? How does my cohort compare to the average of all users? How does my cohort perform at the module level? Are students completing assigned modules on time? Which students are best prepared for the BCBA exam? How do students' Pre-/Post-Test results compare to the average of all users? How do students' Pre-/Post-Test results compare to each other? What are the cohort's strengths and weaknesses before starting the CBA LMS? How effective was the course sequence with respect to each content area? How does the cohort compare to the average of all users? The CBA Learning Module Series has a proven record of effectiveness. However, we continually work to improve learner performance by analyzing millions of responses recorded on our servers. As behavior analysts, we know what measures are important and how to analyze performance data. For instance, rare in most instructional platforms, we include the temporal dimension--latency, instructional time to criterion, and corrects per minute. When we identify a question for which the data indicate a high latency, we examine that question and related questions in the same module and make revisions accordingly. When instructional time to criterion is high, we focus on how responding is allocated across the various multiple-choice options. 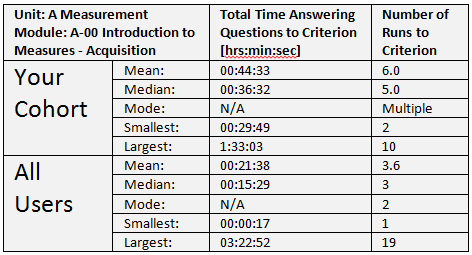 Modules for which latencies and instructional time to criteria are low may indicate that the questions are particularly well written or it may mean that the discriminations required are too elementary. In short, we have developed a process to improve our instruction by analyzing the performance of our learners at the level of the question and the module. We are extremely excited about not only the near-term benefit this holds for our learners, but also the long-term contribution that this process will have on research in instructional design. Students and professors will receive account credentials for discounted purchase and/or access instructions by email. The turnaround time is approximately 48 hours. "We have found the CBA Learning Modules to be a valuable addition to our graduate applied behavior analysis (ABA) program. Students appreciate the opportunity to engage with the CBA modules and love the fact that they will continue to have access once their coursework is completed as a way to study for their Board Certified Behavior Analyst® (BCBA) Examination." "The modules give students the opportunity to build competency and fluency in behavior analytic concepts while identifying areas of strength and areas for improvement. The course dashboard allows faculty to easily monitor student progress throughout the modules. The BDS staff are extremely responsive to programs' needs and provide excellent customer service. Overall, we have been very pleased with the CBA Learning Modules!" "The new platform features make grading so much easier. It is really helpful that I can see the total number of students assigned to me, and the number who completed the modules, and I can sort by date completed. AWESOME!!!" "Thank you to everyone at BDS. I completed the modules to 100% and passed my BCBA exam first time! I honestly think the CBA modules prepared me really well for the exam. I love the hints and the content structure of the modules too!" "The test felt like a breeze after completing the CBA Learning Module Series to 100%. Thanks for making the CBA course accessible, trackable, and useful. I feel confident that I passed the BCBA exam due to the CBA LMS." *Testimonials are unsolicited and are provided by customers who previously used the CBA Learning Module Series as students.